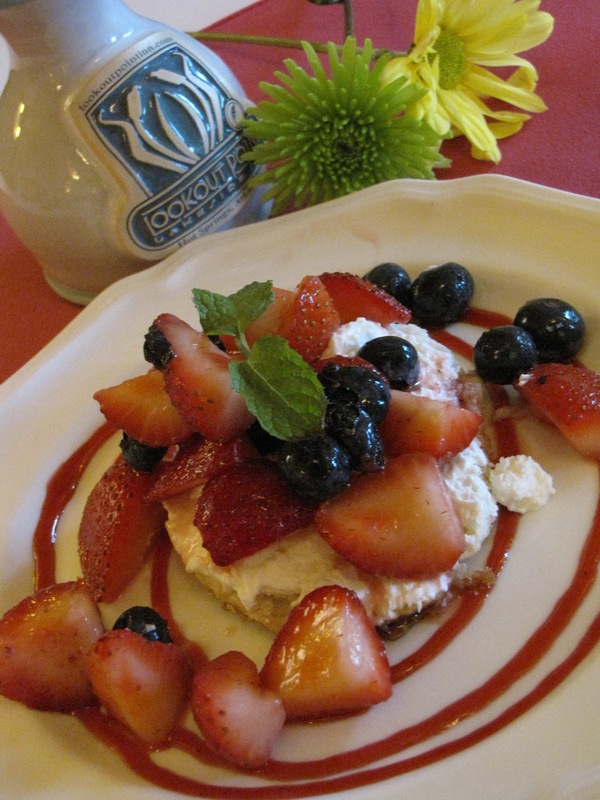 Berry Breakfast Shortcake was a huge hit at Lookout Point Lakeside Inn throughout the summer, pairing nicely as an appetizer with any savory entree. In the winter, frozen berries may be used. Roll uncooked biscuits in sugar. Bake according to your favorite biscuit recipe directions. To simplify, use frozen biscuits and bake according to package directions. Allow biscuits to cool before serving. Sprinkle berries with 2 Tablespoons sugar. Set aside in refrigerator. Whip cream, adding powdered sugar midway through beating. Beat until fluffy. Slice biscuits in half, placing open faced biscuit on plate. Spread whipped cream over biscuit halve. Top with 1/2 cup berries and mint sprig. Enjoy!